Years ago when Hubby and I were on our first canoe trip in Algonquin Park, I thought we would never, ever get to our campsite. Paddling is slow business, and takes endurance and patience. Like the proverbial kid in the backseat of the car, I kept asking, “how much further?” And he replied, that we could stop right then, if we chose, and take a nearby campsite. 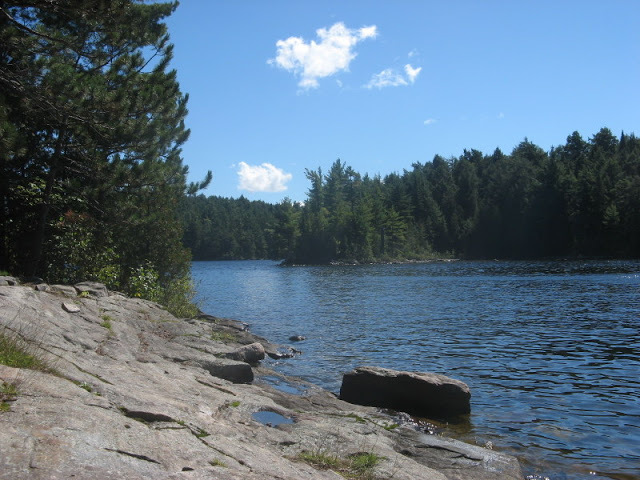 But the best fishing, the best campsites, and the best wilderness camping experience depended on us going “one more portage” than most people. So we did. For those who aren’t familiar with Canadian history, the term portage originated with the early French-Canadian voyageurs, fur-traders who transported their cargo in canoes, and by times had to “portage” or carry it overland between navigable waters. 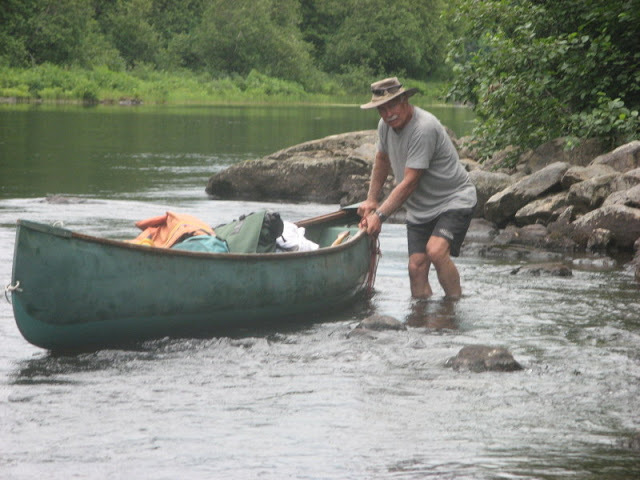 For us these days, it means when rapids or some other impediment requires that we stop paddling, unload all our packs and fishing gear, and carry everything along with the canoe through a trail in the bush to the next lake or river. Over the years of canoeing with Hubby, I’ve walked a few portages, and in time came to believe that the idea of pushing yourself to go “one more portage” is a pretty good motto for life. Most of the time. Ha. Not looking like a happy camper, July 2014. 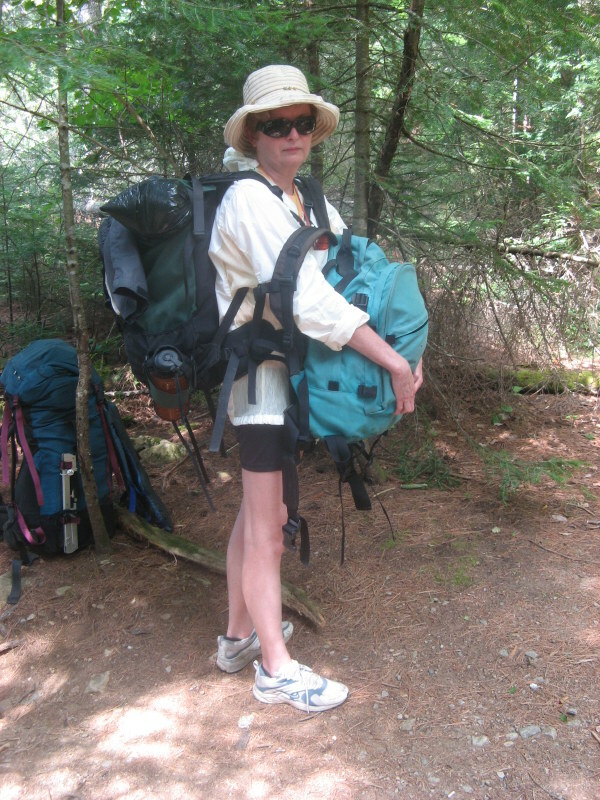 This is me above on a canoe trip in Algonquin Park a few years ago. All loaded up and ready to skip down the portage to the other end. Ha. Funnily enough, a small extra pack on the front makes the big one on the back easier to carry. You feel more balanced. I know I don’t exactly look happy, here. But I wasn’t unhappy, simply asking Hubby why the heck he was taking my picture. I know the fact that I accompany Hubby on canoe trips at all seems utterly unfathomable to my friends. It’s so not me, or the me they think they know. But I love that I can still do it. That I don’t whimp out. Sure, there may be a little whining, mostly inaudible, but no whimping out. And that’s despite the portaging, the dirt, the bugs… and the rain. Sometimes it rains. A lot. Hubby tracking the canoe through some rapids back in 2010. I keep a record of our trips in a camping journal. And occasionally I get it out when Hubby protests that surely it hasn’t rained that often on our trips. I’ll read him a few excerpts just to refresh his memory of those less than idyllic trips. Like back in 1995 when it began to rain as soon as we had loaded all the packs into the canoe and pushed off for the four hour trip to our campsite. As I write in my journal, eventually it rained so hard that the “drops bounced off the surface of the lake, and we were wet through. Even with our high performance Gortex rain gear. And even though the temperature was 22° C, the rain was cold, and steam rose off the lake like patches of low fog. By the time we reached the first portage, I could hardly move my fingers, and [Hubby] said my lips were blue. When we reached the campsite all we could do was set up the tent and crawl into our down sleeping bags to try to get warm. No use trying to start a fire; it was still raining.” We laugh now, at the fact that, when we tried to find dry clothes, we noticed that we hadn’t covered the packs well enough in the canoe, and every piece of clothing we’d brought was wet. Well, almost every piece. Ironically, I pulled on my one dry article of clothing, my bathing suit, before I snuggled down for a nap. It rained for most of our four days in the park, holding off long enough each evening so we could cook our supper, and then sit on a log, sipping hot toddies by the fire, watching as another storm bore down on us from across the big lake. We had one good day of sunshine when we were able to hang everything to dry, and then go fishing for a few hours up the Opeongo River. But, as I write in my journal, “it began raining again as we were making dinner. We were so disgusted that we vowed to leave the next morning, a day early, if it wasn’t sunny. And it wasn’t. So we did.” Ha. As I read through the various tales in my journal I can hardly believe I keep going back. Tales of rain, wet sleeping bags, bug bites, bad backs, leaking tents, and one spectacular zipper fail on a rainy and very buggy night. The door on our old tent had a finicky zipper. Of course I had to pee in the middle of the night, and getting back into the tent quickly so as to allow for the ingress of a minimal amount of rain and the fewest bugs, I zipped it the wrong way and the whole thing fell apart in my hands. There was some major cursing then, I can tell you. And Hubby just stayed hunkered down in his sleeping bag and pretended to be asleep. The coward. Of course it’s not all bad on these trips. We’ve had many, many days of warmth and sunshine, and no bugs. When the fishing is good, and we swim, and see lots of wildlife. Moose, and otters, and loons. 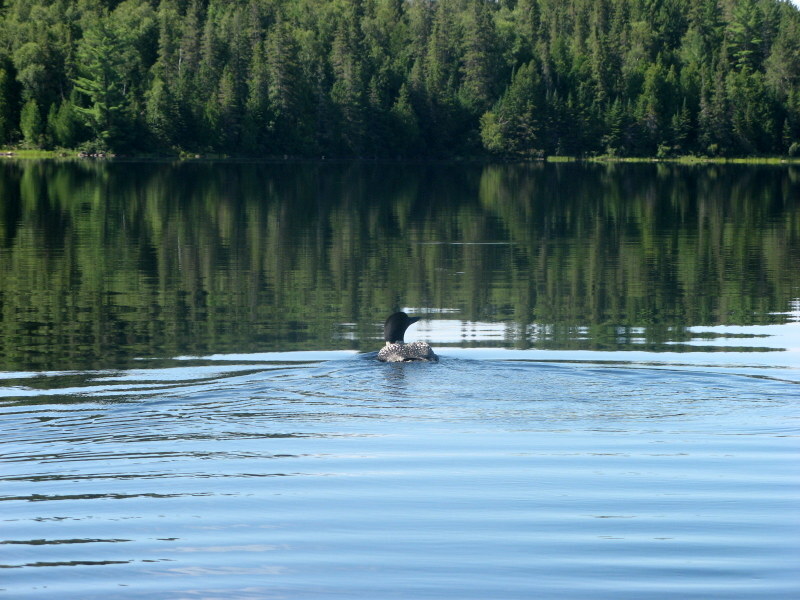 Loons are my favourite. There’s just something so iconically Canadian about the call of a loon. And no bears, thankfully. So far. And after supper we sit around the fire, and sip wine, and watch the sunset. And think how lucky we are to be here. To be able to still be here. To be healthy and fit enough to do this trip together after so many years. I don’t have the same passion for the bush as Hubby, nor the same fortitude in the face of cold, and discomfort, and fatigue. He seems to take strength from being out there. While I feel lucky just to prove to myself that I’m capable of doing a trip like this. Me. A high-heel wearing, nose in a book, hair obsessed wuss. I may whine a little, and curse sometimes, but when Hubby says we’re going one more portage, I’m right behind him. Usually. But, I let him go first. You know. In case of bears. In fact, Hubby is in the park this week, canoeing and fishing with a buddy. I demurred when he half-jokingly asked if I wanted to join them. “Nope,” I replied blithely, “Because…ah… June.” June is prime black-fly season. Canoeing in June is courting with disaster. There will be bugs. Lots of them. Most of them blackflies, which are the worst. You might remember the post I wrote last summer about our trailer camping trip… and black flies. So for numerous reasons, I won’t be going to Algonquin on a canoe trip this year. Maybe next year. Rain, and bugs, and wet sleeping bags aside… I don’t think I’m done with this canoeing thing just yet. How about you folks? Any tales of travel disasters you’d like to share with us? Rain, bugs, bad backs, zipper fails… intestinal issues? We’re all ears. Food cooked on a campfire is the best, isn't it? I always catch the big fish too. Hubby is so busy paddling. He doesn't mind. But sometimes I do. The fish biting keep interrupting my reading. Ha. I do admire your grit and fortitude as I would absolutely hate the canoeing (afraid of deep still water)and the bugs. Went on vacaction to France last year and unlike the previous year was unable to sit outside in the evening because of the mozzies. Well I did the first night and got 35 bites on my legs alone, and needed antihistamines badly as they also got huge. Not going in the mozzie season again, I can tell you as they contiued to bite every single day and night! But it was good to hear of your adventures and that you still do it – go for it! The bugs seem to love me as well. When we travel I always get bitten and swell up, and the swelling and itch lasts for a couple of weeks. I think that "foreign" bugs must sense that tourists present a new flavour. I can understand the appeal of wild places , away from crowds & modern day madness . Our isolated but comfy cottages in Scotland give us a similar kind of holiday & we love it but I can’t camp . Dad was a serious camper & we camped around England & Scotland with trips to France , Italy & Switzerland on his motorbike & sidecar . The equipment is so much better now , our tent didn’t even seem to keep the rain out & we slept on old army blankets over heather that we’d pulled out for padding . Washing was in little streams etc but my younger sister always just pretended she’d washed as she hated it so much . Portage would have been the last straw . So I am amazed that , even with modern equipment , you enjoy it – does Stu realise how lucky he is to have married Wonder Woman ? There's lots of beautiful empty space in Scotland isn't there. I understand why you love it. Sounds like you did some hard-core camping as a kid. Old tents, army blankets… makes me shudder just thinking about it. Ha. Wonder Woman I am not! But I may tell Stu that you mentioned that. I've been in a tent in windstorms and thunderstorms… very scary. Even spent one night in the truck, instead of the tent trailer, one year when a mouse scurried across me in the bed! I was NOT sleeping with a mouse! A friend of a friend spent her honeymoon in a tent, utterly miserable, and eventually after days of rain and sleepless nights, told her new husband…"I hate this tent, I hate camping, and most of all, I hate you." She must have gotten over it, though, because they're still together. This is my first time commenting here, although I've been reading you for over a year. I, too, am a teacher, still teaching at 61 (high school Spanish and French), although I took many years off in between times. In July we're planning a boating trip (25 foot, with the basics, no luxuries) up into the Broughton Archipelago off the northeast coast of Vancouver Island. The weather is likely to vary, and there will likely be bears. I hope they will be seen from the boat and not on the trail. Several years ago we were in Desolation Sound, hiking, and a mother bear and cub appeared on the trail about 30 feet in front of us. Scared? You bet! Fortunately, when hubby clapped his hands and said, "Scram," the bear listened and lumbered down the trail. I'd rather not repeat that experience. I plan for these trips with lots of anticipation and a bit of dread, wondering what we will encounter. Fortunately the anticipation greatly outweighs the dread. That sounds like a wonderful trip, Lorrie. I've never been to Vancouver Island. But camping in variable weather…yep. It always amazes me that after a day or rain, when the sun finally shines and we hang everything out on lines to air, sleeping bags included, build a fire, make a pot of tea… how quickly I feel better. I'm always nervous of bears for the first day or so, then I forget about them. We're careful: no food left around campsite, no food in the tent ever, hang all food in a bag on a high tree at night. Hubby says the bears are always "out there" and he has encountered them a few times. But he does what your husband did, makes noise, so they know he's there and they go away. Hope you have a fabulous time on your trip! You want travel disaster stories?! Well, there was that spring in Sorrento at a second-story bedsit rental when the fire in the gas heater blew out, and I woke up the next morning nearly asphyxiated, fell down the stairs, then crawled back up to open the windows and revive my travel companion with CPR. Protip: Be the one who wakes up. Or the time I was hiking in the Sierras by myself, broke my ankle, ditched my backpack, fashioned a crutch from a tree limb, limped three miles back to the trailhead, and drove myself to the emergency room. Protip: You can get used to pain. Or the night I got to the Luxembourg Airport and learned that Icelandic Airlines had overbooked their flights all summer and hundreds of American retirees had been sleeping on the floor for a week, hoping to get home. Protip: Speak German. Jaysus… you have had some interesting experiences, my friend. If Hubby is not available next time I venture off into the wilderness…I'm calling you! I'd love to hear the rest of that bear story. I did read when we were hiking in the Yukon, that when confronting a grizzly you have to "make yourself look bigger" using a coat over your head or even a sleeping bag. If you're big and loud enough they go away. Crikey Anne , I thought we’d had some disasters whilst on our travels but nothing compared to you . I’d love to hear more – perhaps a guest blog Sue ? How on earth do you remember Niles saying that! He was a great character. I loved the ordering of coffee. I have no tales to share but admire your adventures and glad you've still got it in you even if not this time. I miss that show. Such great writing and directing. So clever. You are a Wonder Woman indeed! I've spend a week with the friend in the mountains once,walking through the woods for hours every day,also not knowing that there were bears….. I know what you mean. When everything goes smoothly the stories are less interesting. You have so many interesting stories, Dottoressa. I'm curious about the UN camp vehicles. Were you working for the UN? Love this! It reminds me of the very first camping trip my hubby and I took together. He was used to wilderness camping… lean-to in the bush, cooking over the fire, etc. I had grown up camping with an old canvas tent and a Coleman stove, but he considered those unnecessary luxuries! We'd been married less than a year and since this was to be a cross country trip from Alberta to Toronto to visit friends, we'd be staying in real campgrounds, not the bush. He did concede to purchasing a small tent and sleeping bags, but he drew the line at a camp stove. We would cook over a campfire. The first evening out, we managed to do just that, but while we were out for an after dinner walk it began to pour rain. It rained heavily all night, finally stopping just before dawn. Come morning, there wasn't a dry bit of wood anywhere to start a fire. Hubby was determined though. He managed to make a lot of smoke, but no flame. After a great deal of grumbling on his part and shivering on mine, we eventually headed into the nearest town for breakfast! Needless to say, we bought a Coleman stove soon after! Now, more than forty years have passed and we have graduated from tent to tent trailer to full size trailer with most of the comforts of home. We still love to paddle quiet wilderness waters though. After passing our canoe down to the next generation last year, we purchased a tandem kayak which is lighter and easier to handle. I remember one year when after a canoe trip I told my friend about the massive thunder storm we had and how frightened I was, and she asked why I didn't just sleep in the truck. Ha. Because the truck was a four hour paddle and portage away. I wish. I'd love to try kayaking sometime. I have never done a canoe trip, might have to try it some time. But I have gone camping in the rain. I ended up moving from the tent to the car to stay dry. Thanks for sharing on #TheWeeklyPostcard. Thanks for continuing to host #TheWeeklyPostcard Anisa. I returned home from a week's "vacation" just last night. On the drive home my sister and I were reminiscing about past vacation mishaps after I told her this one would have to go to the bottom of my enjoyable vacation list. Only a few hours after arriving at our resort, I missed a step and ended up totally off my feet for 2 days and only hobbling around the remainder of the week. Not that fun as I said. I usually have 15,000-20,000 steps daily and did not have that many the entire week!! But the other seven with me had a great time at the beach, a cousin that I had not seen in almost 20 years visited me and I made it to take the ferry ride which I love to do. And then had fun talking about previous excursions on the way home. It is all good!!! And I love your blog!! I know the double-pack face all too well! 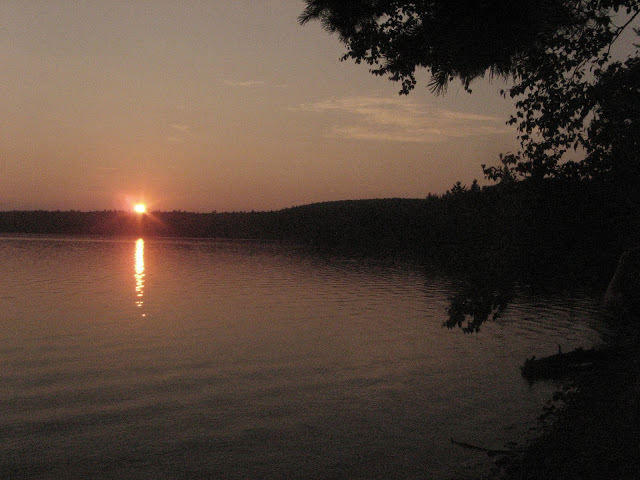 I spent a lot of my childhood in Algonquin on numerous canoe trips. A rainy trip can definitely take the wind out of your sails. I've had a few. But, as you said, there's plenty of beauty there, and the good experiences far outweigh the negative. Also, blackflies are undoubtedly one of the worst things with wings. Ouch! Thanks for sharing on #TheWeeklyPostcard! Oh my goodness, you are an inspiring team. I've never done a trip like this, my hubby has, but have always wanted to try it out. I love the idea of being in nature but am totally unhappy feeling cold and wet for long periods of time. Your photographs and your stories make it come to life for me, the good, the bad and the funny that eventually become your treasured memories. Love this and thanks for linking up with the Continental Drift. It was a perfect read.